Mage Knight was originally a tabletop miniatures game. I first was introduced to the game at my local comic book shop when I was still in grade school sometime in the 90s (I’m old, I know). I first bought a starter pack for my brother and me for Christmas, and he (of course) got the box with the rare mini in it. Years later, the miniature game is basically long gone along with all of the minis that I once owned (lost in one of our many moves). In 2011, Mage Knight emerged from the ashes but is no longer a miniatures game. 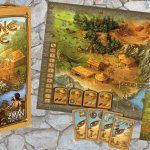 It was reborn as a traditional tabletop board game and completely blew away the board game world with an immense new world to explore (and an immense rulebook). The first edition was completely sold out in 20 days. Then 2018 rolls around and after years of success the definitive Ultimate Edition was released. If you’ve never played or never heard about the Mage Knight board game, now is the perfect time to check it out. The Atlantean Empire needs the return of the heroic Mage Knights. Are you ready? Mage Knight is one of the definitive action/adventure fantasy board games on the market today. 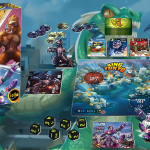 The decision to switch gears and convert a collectible miniatures game into a single box board game is a bold move but it’s worked well for Wiz Kids. It was designed by Vlaada Chvátil who is a rockstar among the board gaming community. He was the designer for several games you may have heard of. There are several more that he’s designed but these are my favorites. In Mage Knight, players will assume the role of a hero of the Atlantean Empire called a Mage Knight. During the course of the board game, players will reclaim territory, siege castles, hunt marauding orcs, delve dungeons, loot wizard towers, and tons more. To say this game is large is a massive understatement. You could get the base game and play it for a year and still not get bored with it. The newer Ultimate Edition isn’t just a fancy reprint either. It comes with all three expansions, 5 new cards, and overall improved production value. Earlier when I said the Ultimate Edition comes with overall improved production value, I may have sold it a little short. Literally, everything about the game has been improved since the release of the base game, and the release of the expansions. Let’s open one up and take a look at what a big box game done right looks like. The first things you’ll notice when opening a new box (other than it’s huge) are the rulebooks. The game comes with several rulebooks for the base game and expansions, but honestly ignore all of them for now. For the first game, you’ll only need the walkthrough book, and I’ll talk about that in your first game. One of the major complaints everyone had about Mage Knight is that it’s super complicated and hard to figure out. I can safely say that the Ultimate Edition solves this issue very nicely. All of the rules have been streamlined and updated for clarity, and they look great. Diving deeper into the box, you’ll see every gamer’s guilty pleasure; stacks and stacks of cardboard cutouts ready to be popped out. The components are all upgraded. When the original game and expansions came out there were slight color variations with all of the tiles. It was a minor issue, but it’s annoying having tiles and hexes that were supposed to go together be off color. The Ultimate Edition has again fixed this issue and everything is a uniform color and quality. This includes all of the card backs that had the same issue. Next in the box are the pre-painted miniatures! I really enjoy painting miniatures, but I’m slower than molasses when it comes to painting them. My 40k army is still only half finished after years. Not only are they pre-painted, but they’re actually painted very well. There’s clearly some that look better, but they look excellent. The crystal counters that came with the game are basically the same. I didn’t really see any difference there. They look cool but I’m as graceful as a whale doing needlework so I tend to knock them around when I play. The inserts are well done. There’s a little cubby hole for everything, and if you’re weird like me and make sure all your games are meticulously put back in order you’re going to like it. The only thing I don’t necessarily like is the token slots. They’re placed in rows instead of stacked, and that tends to get messy. It reminds me of the box from Lords of Waterdeep and how much of a pain it is to put all the money tokens back. Fortunately, WizKids also adds little baggies for storage to help keep everything nice and neat. As far as production value goes everything in the Ultimate Edition is just better. Everything is cleaner, higher quality, and looks fantastic. Whoo boy. This is going to be a doozy. There is a lot going on in Mage Knight. You’re not going to know everything on your first or even your second playthrough. You will, however, have a ton of fun playing and learning the game. I’m only going to go over some basics to help you get started. To try and get every rule down would be a novel in itself. After picking a character, players will find their starting equipment (starting deck). The top right corner of the cards will show which starting equipment belongs to which hero. Mage Knight uses some deck-building mechanics. As players progress and level up they’ll have the opportunity to pick up advanced action cards that give stronger abilities than the starting equipment. Player’s will be using cards for basically all their actions. In addition to the uses printed on a card player’s can use any card to add +1 to movement, influence, attack, or block. For example, if I only had one movement card in my hand that gave me +2 movement, and I needed three that turn, I could use a Block +2 card as a generic plus +1 movement instead of the Block that’s printed on the card text. This can be used for any of the generic actions. You don’t want to do this too much because the printed card effects are always going to be better than a +1 bonus, but you may just need an extra boost. Speaking of the cards you may notice a lot of colors and 2 separate card effects. Each card will have a mana affinity (color) and 2 separate abilities. The ability on top is the generic ability. You will always be able to use this ability. The lower ability can be used only if you spend mana to enhance the card. Throughout the game you’ll have access to mana or magic crystals, and if you spend one that matches the color of the card you can use the enhanced (lower) ability on the card. For example, if you have the Blue Card Stamina in your hand you could simply play it and gain 2 movements for that turn. If you happened to have a blue crystal or access to blue mana you could spend it and instead use the enhanced ability of 4 movement. If you notice in some of the newer expansions cards will be split in half with 2 separate colors. Cards with multiple colors work in a similar way as every other card. Play the matching color of the mana and you’ll get an improved ability. The multicolored cards give 2 options of colors and 2 options of abilities. Players will be able to play either one to gain an ability. These cards give a deck much more flexibility and plenty of options when choosing a strategy. Most cards in the game will use this mechanic. Match up the colors with mana and you’ll get a better ability. You won’t always have access to the right colors of mana and it can shift rapidly throughout the round. Wound cards are a special kind of card in that they are completely useless and terrible to have. If a player every fails in combat, they might take some wounds. For every wound a player takes, wound cards will be added to their deck. They can’t be discarded normally. You basically have to waste a turn resting to discard the wounds. To actually get rid of them and remove them from your deck you’re going to need to heal up in a town or use a healing spell. One of the constant threats all players will need to look out for are wounds. If a player manages to take 5 wounds fairly early in the game they’ll be severely handicapped. Each card takes up a space in a player’s draw hand and can’t be used for anything. It’s hard enough trying to complete actions without a limited selection of cards. Mage Knight uses a Night and Day mechanic. During the day traveling through forests are relatively easier and traveling through a desert is harder. During the day players can also use the yellow sun mana (if it’s available) to power up their cards. When a round ends the phases will shift. Day turns to Night and Night turns to Day. During the night phase walking through a desert is much easier, and if you’re unlucky enough to get stuck in the middle of a forest during the night you’re going to spend a ton of movement points traveling back out. Night also has its own special mana. On spell cards, there will be 2 options to use just like every other card, but to power up a spell, you don’t just spend a mana. You have to spend the matching colored mana and a black night mana to power up spells. It’s a lot harder than the other cards, but powered up spells are brutal in game. The night mana has no other uses, and if it shows up during the day it cannot be used. When searching in a dungeon the night rules will always be in effect. I always thought that was a cool thematic element. Dungeons are meant to be dark and scary anyway, and they’re even more difficult considering you can’t use any of the sun mana. You’ll be able to use the black night mana as if it were a night phase any time you’re in a dungeon, even if it’s the day phase. Another cool part of the game is recruiting mercenaries. In certain locations on the map players will have the option to spend influence points to recruit powerful allies. Each one will grant different bonuses and abilities, and who is available to recruit will change from round to round. Mercenaries are not heroic Mage Knights though, and their bonus abilities can only be used once per round. After that, they’ll need to rest until the beginning of a new round. Mage Knight uses some familiar deck building mechanics. At first level, the card hand limit for every player will be 5. As players level up they’ll get better abilities (cards) able to hire more mercenaries, and their hand limit will get higher. After each turn players will put all cards that they used into their discard pile and draw back up to their hand limit. When a player runs out of cards or decides the few they have left aren’t worth sticking around for another turn they can announce the end of the round. Every other player gets 1 last turn in the phase and then the round ends. Night will turn to day, and day will turn to night. Unlock other games where you start as a zero and work you’re way up to hero, Mage Knights are heroic characters from the beginning. By the end of the game though you’ll just be a more famous hero. The big Fame and Reputation board will keep track of both of these levels for all players. Fame is basically exp. For every monster or objective, a player takes they’ll gain fame. At 3 experience, players will go up to level 2, 7 exp players will go up to level 2, etc. If you noticed the going up levels get harder and harder the higher up you go. The first few levels will be pretty quick, but it slows down the longer you play. As player’s level up you’ll notice that the leveling will alternate between gaining new skills & cards and gaining command tokens. Each command token indicates how many followers/mercenaries you can have with you. In a case of art imitating life, the more fame you have the more followers you have. Reputation tracks how well-liked a Mage Knight is. Not all fame is good fame after all. Players could be known all across the land for protecting towns, slaying orcs, and heroic deeds. They could also be known for robbing towns, assaulting people, and burning down monasteries (yes you can burn down the monastery). Higher reputation means players will have a boost to influence that can be used to recruit, and buy things in towns. A lower reputation gives a negative influence modifier so everything is going to be much more expensive. If it gets so low that it hits the bottom of the track then towns will refuse to deal with you outright, and you won’t be able to purchase or recruit anything. Each game you play will have a different objective with special rules and instances. The suggested first game ends when a city is discovered. The most common end game scenario is when all of the cities are conquered. 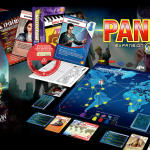 On top of all of the scenarios that come with the box, the game is designed to be pretty open-ended. You could make up your own scenario, and there’s a ton of fan-made content all over the web. Step 1: Don’t start with the rulebook. Step 2: Read the walkthrough. Mage Knight’s rulebooks have all been refined and are much easier to follow. The walkthrough game is taken at an excellent pace and introduces rules as they come up. If you’re like me and like to read rulebooks cover to cover before the game is even out of the box, you’re going to get a headache. The Walkthrough game is a simple scenario that can be played with 1-4 characters. I played it as a solo game to pick up the rules. I like to get a feel for a game before I explain it to anyone, and It’s a pretty awesome solo game in its own right. To start your first game, you’ll be placing the map tiles in order so that the 1st 3 tiles will always be in the same spot. The greener countryside tiles will be placed in order and stacked on top of the light colored core city tiles. I always thought that was a cool mechanic. That way players will start out at the fringes of civilization and move forward into the more civilized parts of the world. For the first game, the objectives are simple to help you learn. The Mage Knights are on a recon mission to the city. The overall game objective is to explore the map tile that has a city on it. That’s not a whole lot of fluff, but you’ll have plenty of time to wander around and get used to the basic mechanics and map tile locations. Throughout the game, I bounced back and forth between the walkthrough board and the game, and it took me about an hour just to get everything set up. Once you have an idea of what everything means it’s going to be much quicker in setup. I had a blast playing the setup. The game has so much going on and I couldn’t wait to play again. Follow the walkthrough booklets and you’ll be fine. It’s a complex game, but the walkthrough makes it far less intimidating. Great value in one box. The base game alone you could play for a year and not get bored. The Ultimate Edition comes with 3 expansions. In a game this heavy there’s always going to be a lot of questions, and just as I’m not going to be able to cover all of the rules in this article (I went over the bare minimum to give you an idea of what you’re getting into) there’s still a lot of questions. WizKids did put out an FAQ, and as I probably mentioned a thousand times now, the Ultimate Edition rulebooks are very well-written. You can check out the Official WizKids FAQ here. Everything has been updated in Ultimate Edition. If you like action/adventure in a fantasy setting, you’re going to be hard pressed to find a game that offers this much content in one box. The only other game off the top of my head that I can think of would be Gloomhaven. The biggest complaint that I’ve heard about Mage Knight is that it’s too complicated and the rules are hard to follow. Yes, it is complicated, but with the walkthrough game and the streamlined rulebooks, it’s not as difficult to learn. After 1-2 games, you’ll be set. You still may refer back once or twice, but for the most part, you’ll have everything you need down. To give you my final thoughts on Mage Knight Ultimate Edition, let me start at the beginning. My first game using the Ultimate Edition was a solo game. I didn’t use any of the expansions and I didn’t look at any of the cards or stacks of monsters beforehand so everything was fresh and everything was a surprise. I’m not going to lie, it took me about an hour and a half to read and set up the initial board. My first round I was nose deep in the walkthrough booklet more than I was looking at the actual board, but after that, I spent most of my time planning and moving. I was the hero of the realm, slaying roving bands of orcs left and right. I recruited some scouts on round 2 and laid siege to a keep, claiming it as my own. With my renewed resources I decided it was time to take on a wizard’s tower. “Those pointy hat wearing pansies can’t stop me!” I shouted to the ether. They proceeded to beat the crap out of me while I used my trusty scouts as meat shields for a tactical retreat. Hurting slightly, I pressed on and came across a dungeon. My scouts wouldn’t be able to help me even if they weren’t wounded and I was relatively fresh. Onward. The dungeon run didn’t end well. Again, I was forced to retreat and this time there were no meat shields in sight. After several more reckless and ill-timed combat encounters, I was full of wounds and resorted to ransacking towns and monasteries in an attempt to recoup some of my losses. When I finally found the city I was looking for, I was a bedraggled mess full of wounds and all of my followers rued the day they met me. I’ve rarely had so much fun in board game solo or otherwise. There are so many options and ways to play, giving each game a very unique feel to it. The game looks gorgeous all set up and you get to create amazing stories as you explore the world. Fame and Reputation work so well in the game and feels so natural. I love leveling mechanics and would find myself seeking glory by taking detours to locations I probably didn’t need to go but had a blast every step of the way. The biggest complaint I’ve heard is that the game is too complicated and hard to learn. All I have to say is follow the walkthrough game. It explains everything in a progressive way. You’ll only be prompted to read the rules as they come up and you get into the game much quicker. After only one round I felt pretty comfortable with the basics and only had to refer back to the rules a few times after that. Mage Knight is a winner in my opinion, and Ultimate Edition just pushed it higher on my favorite games list. Check it out. Don’t be intimidated by the hype or rules. It’s a ton of fun. No spam. Just board game goodness. 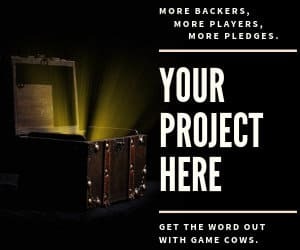 Gamecows.com is a participant in the Amazon Services LLC Associates Program, an affiliate advertising program designed to provide a means for sites to earn advertising fees by advertising and linking to Amazon.com. 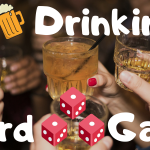 How Well Do You Know Board Games? Take our free, 5-minute quiz and find just how much you really know.